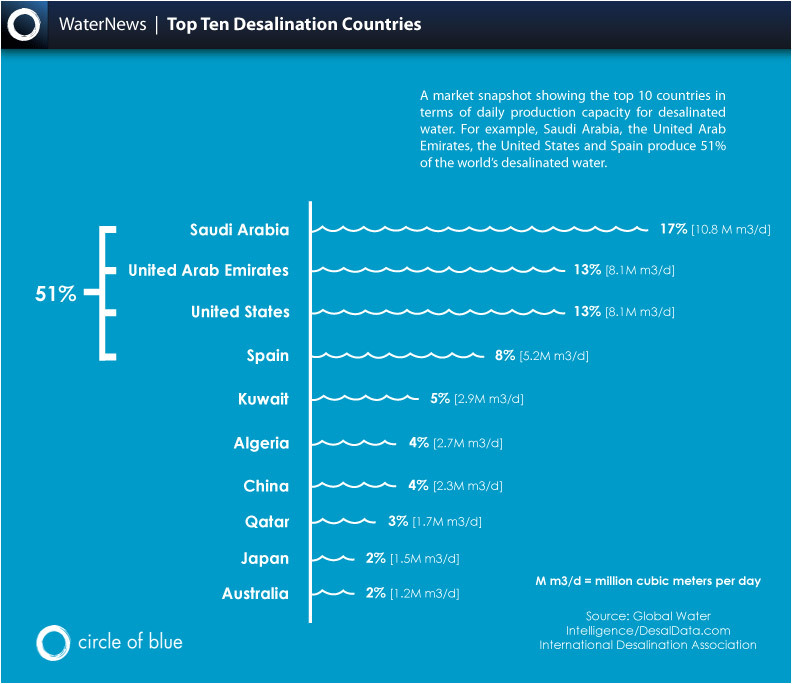 Large scale desalination already takes place in the United Arab Emirates (UAE). This plant in Ras al-Khaimah, contributes to the nearly 8.5 million cubic meters of water produced per day in the UAE (click image to enlarge). Over the last five years, an average of 800 new desalination plants have been constructed annually, according to various industrial reports, and the global market could reach $58 billion a year. In 2006 and 2007 alone, according to Global Water Intelligence, an industry research group that tracks water trends, the world’s desalination capacity grew 43 percent, and since 1990 has experienced an average annual growth rate of 17 percent. About 14,380 desalination plants operate across the world, said Global Water Intelligence, with a total contracted capacity of 62 million cubic meters, or 16.3 billion gallons, per day. “In the last ten years, there’s been almost exponential growth, and I think it’s going to continue to grow,” said Tom Pankratz, member of the board of directors of the International Desalination Association. Infographics by Hannah Nester/Circle of Blue (click any to enlarge). But even as desalination emerges as one of the world’s important infrastructure development industries, attracting globally significant companies like General Electric and Veolia Environment, environmental and economic authorities have raised concerns. “Desalination plants are enormously expensive, use tremendous amounts of energy and have major environmental costs that are not always adequately addressed, including brine disposal, impingement and entrainment of aquatic organisms and coastal development problems.” said Peter Gleick, president of the Pacific Institute. 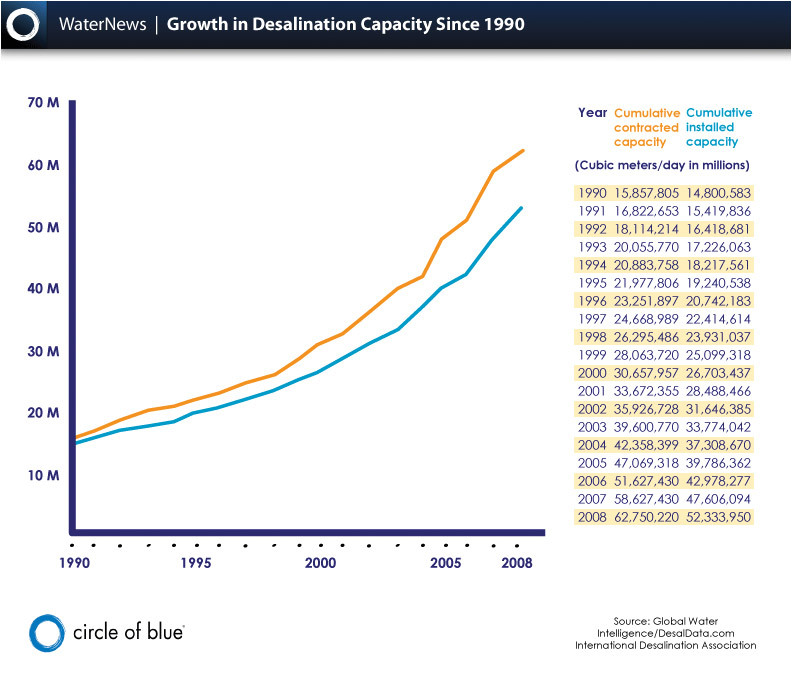 As is so often the case in the 21st century, the growing desalination market is made possible by powerful trends that have converged. Technology has dropped the per-gallon cost of turning seawater or brackish water into drinking water, and improved the energy efficiency of plants. Shortages of fresh water and the unyielding movement of the world’s rural people to cities has dramatically increased the need for alternatives. The Middle East has long been the dominant market, with Saudi Arabia producing more than 10 million cubic meters a day and the United Arab Emirates producing almost 8.5 million cubic meters a day, according to Global Water Intelligence. But the United States is now the world’s third leading builder of desalination plants. Other top markets are Spain, Kuwait, Algeria, China, Qatar, Japan and Australia. Almost two-thirds of all desalination plants use seawater, with 19 percent drawing from brackish sources. 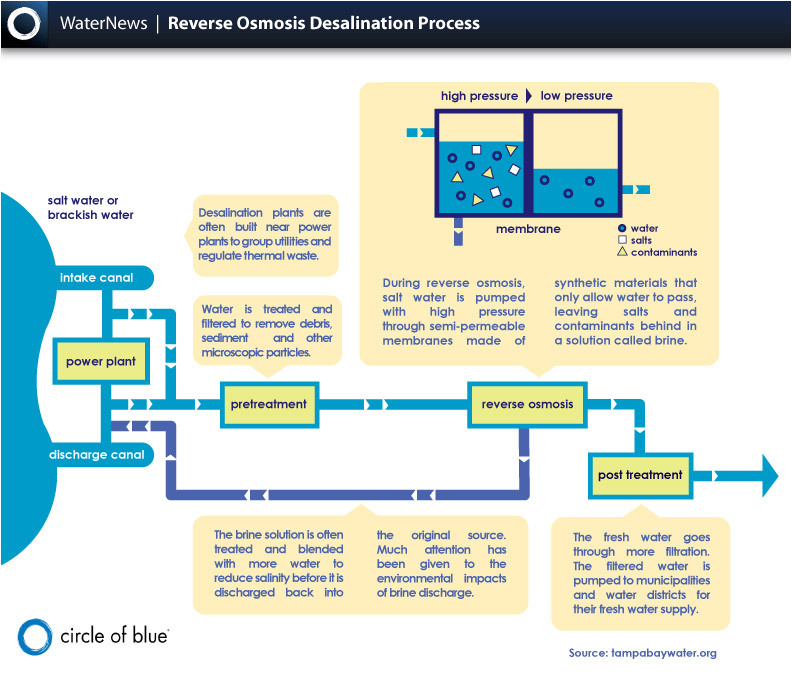 Without any other sources for freshwater, desalination is quickly becoming vital to many regions. St. Martin’s desalination plant is run by France’s Veolia Water Caribbean. The industry’s leading companies — France’s Veolia Environment (5.4 million cubic meters a day), Italy’s Fisia Italimpianti (3 million), South Korea’s Doosan (2.8 million) and GE Water in the United States (2.5 million) — now compete with hundreds of companies for lucrative municipal contracts. Fulgham said GE is involved in desalination in more than 100 countries and will reinvest 3 percent of its overall revenue in technology development over the next three years –- a large piece of which will be going to seawater desalination, brackish water desalination and water reuse projects. Companies are attracted to seawater desalination, executives say, because the projects are very large — usually in excess of $100 million — are very visible and often generate lots of publicity, making them attractive to private firms. In Carlsbad, Calif., Poseidon Resources is finishing permitting on a desalination plant that will supply 50 million gallons a day to nine Southern California water municipalities. The company selected Barclay’s Capital to oversee the $300-plus million project, said Scott Maloni, vice president at Poseidon Resources. The basic business strategy is straightforward. Although the plants involve significant investment, most projects come with a sovereign guarantee that municipalities will purchase water as long as the plants continue to produce it. Along with the water purchases, the companies are usually contracted to operate the plants for up to 20 years. Pankratz predicted that the total global seawater desalination market could be worth $25 billion over the next five years and $58 billion over the next ten years. Although significant energy, funding and political attention is behind the desalination movement, Adam Scow, California Deputy Director for Food and Water Watch, said he is wary of this “silver bullet” technology. According to calculations in Desalination, With a Grain of Salt, a recent study on the role of desalination in California by the Pacific Institute, if all of the 20 proposed plants were built, seawater desalination would supply six percent of the state’s 2000 urban water use. Food and Water Watch, the advocacy group, interprets this statistic in their report Desalination: an Ocean of Problems, which said that if all these plants functioned at their full capacity, the additional water would only be enough for every Californian to take an extra three-minute shower a day. Neil Palmer, general manager of technical services and operations at OSMOFLO, a supplier of reverse osmosis desalination plants based in Adelaide, said that before 2006, Australia had no large desalination plants. By 2012, though, the country will be producing about 1.3 million cubic meters per day, with at least one large facility in all of its major cities. Palmer approximates that water out of a desalination plant in Australia — including all input costs, finance charges, operations and maintenance — would be about $0.96 per cubic meter. If the water came from a reservoir and a water treatment facility, he estimated, it would be closer to $0.32 per cubic meter. Many in the industry see a silver lining in the higher pricing of desalinated water: people will be thriftier and use less. Palmer said that the pricing of water in Australia has always been too cheap. “We are the driest continent, and our prices for municipal water are about half of what people charge in Europe, where there is admittedly more water,” he said. Joe Geever, Southern California Coordinator for the Surfrider Foundation, takes issue with looking to solve water shortages with desalination. In Southern California, Geever said, the majority of the water supply is imported from the northern part of the state, contributing 15 to 20 percent of the state’s current energy demand. Geever said that in accordance with state laws, which compel Californians to reduce their climate impacts, the prime target for this reduction is water management and cutting back on wasted water. The large number of desalination plants springing up world-wide only goes to indicate that all over the world people are hard pressed for fresh water. 70% of the earth’s surface is covered with water, but only 3% of it is fresh water. Most of this fresh water is trapped in glaciers and icebergs and only 1% of it is available to us for drinking, washing, cleaning etc. While desalination is becoming extremely population, it is important to note that it is an expensive process and the answer to the fresh water shortage lies in Conservation. “[Desalinated] water is three times more expensive, therefore you don’t want to waste it,” he said. “So water authorities have to charge accordingly, and people will use less water and waste less water.” —-of course this means that people who can afford (rich guys) can use (or waste) water as much as they want but the people who can’t afford (poor guys) are the ones need to use less or maybe none. The same old story. “The most reliable, most cost effective and most environmentally friendly source of water is conservation, increased efficiency and waste prevention,” —-I vote for this method where everybody can participate, rich or poor.